Don came to the Red River Farm Network as a farm broadcaster in 2003 and is now the company’s president. He is a National Association of Farm Broadcasting past president and has been the National Farm Broadcaster of the Year. 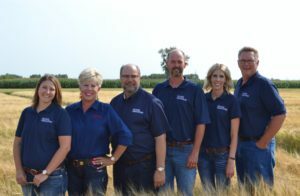 Randy joined the Red River Farm Network in 2007 after stops in the West Point, Nebraska and Willmar, Minnesota radio markets. He farmed for 20 years at Clara City, Minnesota. Carah, who is a Missouri native, joined the Red River Farm Network in 2015. Previously, she worked in public relations and account services, serving agriculture clients in soybean, dairy and beef checkoff programs. Hart has also explored agriculture and history in Germany, England and Sao Paulo, Brazil. The newest member of the Red River Farm Network (Grand Forks, ND) farm broadcaster Megan Ternquist began her first week with the network July 24, 2017 in Grand Forks. “Megan is a welcome addition and will be a huge asset to our team,” said Red River Farm Network (RRFN) President Don Wick. She has North Dakota roots, being raised on a third-generation diversified crop and beef cattle farm near Petersburg.